The weakest of hurricanes can cause irreparable damage to a home and household. A formidable hurricane leaves a path of destruction in its wake, leaving roads and homes damaged and families without power or running water. From safe-guarding a home with boards or shutters, to gathering a variety of provisions, there is much to account for. With a slew of hurricanes potentially affecting residents during hurricane season (June 1 – November 30 on the Atlantic Coast and May 15 – November 30 on the Pacific Coast) having a clear plan of action and all the supplies for a worst-case scenario is prudent. Hurricanes are categorized by their wind speed and potential to damage trees or structures, as well as their potential for floods or power loss. This is the “weakest” of hurricane categories, characterized by sustained winds of 74-95 mph. These winds are considered very dangerous and can cause damage to a home’s roof and shingles. Tree branches and smaller trees often fall or may be uprooted. Power lines are likely to be damaged by winds and felled trees, causing power outages. These winds are extremely dangerous, running between 96-110 mph. The roof and siding of solidly constructed homes will likely be damaged if the hurricane hits in the area. Trees are often uprooted or felled and block many roadways. Almost all power in a region will go out for between a few days and a few weeks. This is a major storm. Sustained winds are between 111-129 mph. More likely than not, devastating damage will occur to homes, trees and roadways. Electricity and water may not be available to everyone for days or weeks after the storm dwindles. This is categorized as a major storm. Catastrophic damage can occur to well-built homes’ roofs and exteriors. Power poles and many large and small trees often fall or snap. Power and water may not be available between weeks and months. A lot of cleanup afterward takes weeks to clear the roads and surrounding areas of debris and damage. This category has sustained winds of 157 mph or higher. Framed homes can expect roof damage and collapsed walls. Power poles and felled trees often block routes and isolate neighborhood inhabitants. The most-affected areas will be uninhabitable for weeks or months. Store one gallon of water per person in your household, per day. Aim for at least five-days’ worth of water. Use plastic containers such as pitchers, carafes and bottles to store as much water in your freezer and refrigerator as possible, with considerations for food too. Remember to gather drinking, food preparation and washing water. You may have to bathe or wash dishes and clothes with it if your water goes out. Fill your bath tubs and sinks with water for washing the night before the storm is set to hit. When facing off with a hurricane, reinforcing your home is one of the best approaches to contribute to your family’s safety. Be aware, however, that safeguarding your home with reinforcements does not always guarantee your house will come out unscathed. The reinforcements may serve only to reduce the overall damage caused. Regardless, doing nothing to protect your home is never recommended. Consider the following options for your home’s windows. 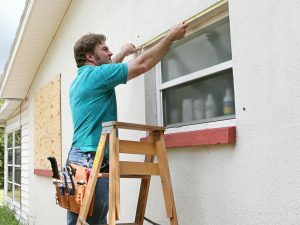 The cheapest – and least desirable approach – is to put duct tape on your windows in preparation of a hurricane. By taping an “X” from one corner of a window to another, and crossing that “X” with more taped lines, you are taking a precaution to keep shattering glass to a minimum. The idea is that if flying debris hits an exposed window the glass would hopefully remain largely intact and not all over the floor. If you have no other means to protect your windows, duct tape provides minimal damage control. Plywood boards are much more desirable than duct tape. Some people even prefer them to shutters. However, there are some problems you may come across with plywood boards. If you are buying them when there is a potential hurricane upon you, there will likely be little to no supply left, as countless others in your city are also rushing to purchase them. The screws you need to drill them into the house may also be out of stock due to the consumer rush. Related Article: Who needs flood insurance? If you own a set of boards, they can rot over time. You may have to replace them yearly. If not, the old wood may not stand up to the storm. You also need ample space to store them and a powerful drill, a helper and beginner level knowledge to put boards up. Shutters are great for coastal homes, summer vacationers, general safety and convenience. Shutters are often made of metal, which can withstand a lot more punishment. Many are also installed accordion style, which means they do not need to be stored anywhere. In addition, accordion-style shutters are quickly deployed in minutes around the whole house. One drawback is that they are initially costly. Strapping down the roof – Get a set of hurricane straps to better attach them to your house’s frame. Tarp and sandbags – Use tarp and sandbags to cover any known holes in your roof. If you live in an area prone to flooding, use sandbags to block entry and exit routes. Clear the front and back patios – Clear the yards and patios of tables, chairs, toys, fireplaces, grills and other loose items. If you have a canopy or hammock, dismantle it and bring it inside too. Test supplies – If you have a generator, put some gas in it and test it. Do the same for your flashlights, power inverters, radios and other supplies that need some form of power (gas, battery, solar, etc.). It is better to assess and replace a broken item ahead of time than to find out about it when you need it. Clearing and cleaning – Remove shrubbery from your yard, clean the gutters and minimize the number of items that may fly toward your house during the hurricane. Look for brush, loose twigs or branches, rock piles, broken glass, tire piles, etc. Clean the inside of your home and consolidate emergency items so you have easy access to them when you need them. Related Article: What does homeowners insurance not cover?